Eleanor grew up in the Dukedom of Aquitaine at a time when most of France was ruled by England. In northern Europe, and England, women had little social standing. Aquitaine, in the south, named "land of waters" by the Romans, was a rich land, filled with orchards and vineyards; life was good for those in power. Leisure was preeminent and women were more highly respected. They could inherit property and many became wealthy landowners. Such was Eleanor's case. She had inherited Aquitaine, which made her a rich prize for any king. She was only fifteen when her father, the Duke, died, and King Louis the Fat (he was so enormous he was virtually unable to sit up) arranged a marriage between his second son, Louis, and the attractive Eleanor, now heir to the most prized lands in Europe. Louis was a retiring young man best suited, most thought, for the monastery. Eleanor wasted no time -- remember she was still an adolescent -- corrupting (in the mind of her mother-in-law) Louis to the more secular ways of the south. Their marriage was a catastrophe. He was ineffectual, indecisive, inadequate, generally most ofthe "in's" one can apply. Louis' Second Crusade was a disaster. The presence of Eleanor and her ladies with their enormous baggage train made travel difficult. The Pope's personal intervention, virtually dragging them to bed to force reconsumation of their marriage was the catalyst for the final dissolution, because the product of this pathetic reunion was a girl, and Louis' Capetians desperately needed a male to continue the line. Then Henry and the Plantagenets entered on the scene. Interestingly, Plantagenet was not a family name. It came from a nickname of Henry's father, Geoffrey of Anjou, who used to wear the yellow blossom of the broom plant, the planta genesta, in his hair. Eleanor was tired of Louis -- once she said it was like being married to a monk -- and when she met eighteen-year-old Henry, eleven years her junior and heir to Anjou and all of England, she fell head over heels in lust for him. Meade suspects that sexual attraction, richly spiced with political advantage, was a major justification for her divorce from Louis. Consanguinity was the publicly announced reason permitting annulment. She married Henry eight weeks later. It was a stinging slap at the Capetian, for he and Henry were bitter enemies. Henry Plantagenet became the most radical monarch in English history. During the next thirty-five years he revolutionized government, streamlining it and making it so efficient the government could function king-less if necessary. Eleanor played a major role in the reexamination of the role of women in the twelfth century. Even the Church abandoned its traditional view of women as an instrument of the devil, but women continued to oscillate between superiority and inferiority. Eleanor and her daughter by Louis, who lived with her as she approached her later forties and became estranged from Henry, made a conscious and deliberate effort to define the female role in a legal code of social conduct called Tractus de Amore et de Amoris & medies. It was loosely modeled after Ovid but is almost the opposite to his Art of Loving. Their tract proclaimed woman to be the" dominant figure, the man merely a pupil who must be carefully instructed until he becomes a fit partner for his lady. " Woman is supreme, a goddess to be approached by her man only with reverence. When Eleanor died at age 82, she had been a queen for sixty-six years. She produced several sons, including Richard Coeur-de-Lion, famous for his third crusade but notorious for his flaunted homosexuality (a problem because it meant he would produce no heir), and King John, whose meanness, recklessness and appalling judgment resulted in the Magna Carta. Perhaps because of his evil personality, he was the only English king ever named John. Eleanor was the glue that held the Plantagenets together, and after her death, her first husband's descendants made considerable inroads into Henry's Normandy and her beloved Aquitaine. Average biography of Eleanor of Aquitaine. It does a good job of bringing together what evidence we have for Eleanor's life--her political involvements, her family disputes, her religious and cultural patronage--but it has to be admitted that what we have isn't much. Meade falls into the trap of saying that Eleanor 'must' have done such and such, or 'must' have felt something else, when she has no evidence beyond her own extrapolations and inferences. Decent introduction, but take it always with a grain of salt. It's a pity that there's so little solid information about Eleanor of Aquitaine, leaving us to wonder about her motives, her actions, and her looks all these centuries later. Even the little we do know for sure about her makes her an extraordinary personage for any age.While I enjoyed this easy and informative read I could never shake the knowledge that it's often speculation--what she thought, how she felt--and so must be taken with a grain of salt. Still, I'm glad to have read it and will continue to read more on the era and look for more on Eleanor herself. This book was thorough, but readable, and I enjoyed the unapologetically feminist approach. Meade did not hesitate to point out the number of things Eleanor did that were unique for a woman living when she did. The entire book moved along, and it would be a good start for anyone looking to learn about Eleanor of Acquitaine. It just doesn't quite live up to Alison Weir's masterpiece on the same subject. This was a hard read. I like reading historical/biographical fiction. But this one was hard. It definitely did not flow easily. But it was interesting, and kept me company between classes in college. Eleanor of Aquitaine, by Marion Meade, is a well-written, highly informative and entertaining read about one of Europe’s most remarkable and influential women. Meade places Eleanor on the large as well as intimate and personal stages, allowing readers to understand what made Eleanor into the cultured, sometimes tempestuous, always intelligent woman who loved and lost two kings and empires. Highly recommended. Bought this in a secondhand shop off of Rue de Severin in Paris and consumed it by the time I was back in London less than a week later. 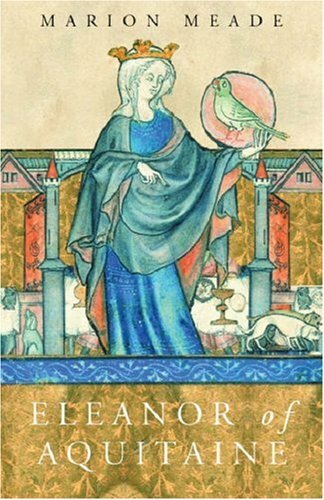 A really gorgeous, lively biography of a really gorgeous and lively woman, and it has one of the best lines about Eleanor of Aquitaine, about how she was the wife of two kings and the mother of Richard the Lionhearted, but whenever we think of her, we only ever think of her as Eleanor. Really, really wonderful. This is okay. My mom really wanted me to read this book. I enjoyed the historical references. It was a little long and sometimes boring but still a nice read. For historical buffs the book is great. For novel lovers, steer clear. Eleanor of AquitaineMarion MeadeRead it in disintegrating mass market oversized paperback at 416 pages including tiny biblio and appendix.In a century almost exclusively dominated by men Eleanor stands apart and above her contemporaries. Over the course of her life she married two kings and mothered three (two of which actually sat on the Plantagenet throne.) She traveled with her husband to the distant lands of the near east as an active Crusader and came from a court that espoused the virtues of troubadours and poetry. She was a glimmer of light in an otherwise very dark part of history. But despite all of this she created a lot of chaos, she pulled strings and worked actively against her first and second husband and in a way she facilitated the destruction of all she fostered. An interesting character for sure.The problem of course is that ancient sources for Eleanor are thin. Most of what we know about her movements, what charters she signed, and her overall communications is very limited and comes from her kingly attachments. Meade is simply forced to use a very reduced set of source material from the age, most of which details her husband's movements or the chroniclers that make short reference when she's in procession. This all translates to a widely speculative biography where Meade takes the liberty to hypothesize and expand on the unknown. I'm not always sure Meade is successful in that. She lets herself speculate on how Eleanor felt about this or that and we have no way of knowing and Meade often justifies her actions which were tantamount to tyranny. She is successful though in outlining this Queens amazing life in amazing times.Worth a read I suppose if the 12th century Europe is of interest to you. I also see that a lot of women seem to enjoy Eleanor or at least reading about her, no doubt because of her influence in a time dominated by males and their interactions. Eleanor of Aquitaine was indeed a woman worth a biography, even with the scanty details about her life as we have, as a very interesting historical figure of Medieval times between France and England. We do have plenty of information about her life but not about her the woman. Marion Meade makes this up I'm afraid with a lot of personal wishful thinking: where there's not one single physical detail to grab on to, she makes her come to live by inferences from her relationships with other people and by her own way of life. Where no witness can be called on to tell us how she felt, or what were the inclinations of her heart, Ms. Meade fills in the gap with her own stuff, which is not bad stuff if we speak in terms of fiction, even historical fiction. For she moves on swiftly through the myriad of happenings taking place family-wise and historical-wise strictly speaking. We attend the Crusades, we travel throughout most of modern France over and over, we witness battles, family feuds, coronations, the killing of Beckett, and much, much more. All of it interesting enough, and presented as in relation to Leonor's life. So historical facts abound. And it does not become entangled at all (it could easily have been). But I'd rather have made up the gaps myself. I think an honest historian needs to draw the line clearly between what we know and what we assume. Mixing fiction and history doesn't help credibility. Of course the creative facet of the author only operates on the deeply personal level; historical facts are not messed with. But nevertheless, when I am reading history I'd like the author to stick to the facts, and whatever incursions into fictional territory I'd like to be -at least- warned. Its a good read, though; a bit too long, but makes for a good history read. This book has been sitting in the attic for nearly a decade. As a student I tried to read it for my studies and gave up. While very readable, you are left wondering how much of it is true as Marion Meade continually over-stretches her sources and tells you how characters "must" have been feeling. Ultimately, the work feels like it could be fiction.While the author, writing in 1977, can perhaps not be expected to have overthrown the then-prevalant views of some topics where research has uncovered uncertainities and raised new questions - over the existence of courts of love, for instance, or against Richard the Lionheart's homosexuality - some errors and curious turns of phrase do creep into the text. To pick one small example, it would be hard to guess that Richard faced some (admittedly relatively minor) military resistance in support of his brother John, after his return from captivity. Eleanor and he 'made a relaxed progress to Nottingham' - no mention of his assault on the castle and subsequent council at which he ordered the punishment of many of John's adherents.Now that I am reading "Eleanor of Aquitaine" for pleasure, I am free to enjoy the book, but anyone using this for study would be advised to keep "Eleanor of Aquitaine: Lord and Lady" a collection of essays edited by Bonnie Wheeler and John Carmi Parsons close at hand. While a long book and Marion Meade clearly has a strong bias in favor of Eleanor, the book is fascinating both from its amazing history of world/European geography as well as feminism's roots. I was either never taught in my history classes or failed to comprehend just how tangled up the boundry lines of all of modern European countries have been during the last millineum. The feuding between such "stable" nations as France and England as late as the 12th century and even the fighting between royal siblings for power and property gave me new perspective on world politics today. Additionally, the failed history of the Crusades and the "truth" about such modern mythical heros/villans such as of Richard the Lion-Hearted or King John is quite interesting. Eleanor herself is obviously an astonishing women -- even for modern times her energy and persistance would be legendary. More young women need to be taught today her belief in self-determination. An insightful biography of a highly interesting woman. I have never read anything about Eleanor of Aquitaine before and I found this book was very well researched and a delight to read. I recognised a few of the key players in her life (especially Thomas of Beckett, Peter Abelard and Richard III) and it was great to find out more about the times they existed and the main powers in Europe at the time. Eleanor of Aquitaine didn't leave any diaries and none of her contemporaries even described her appearance except to say she was beautiful. The author took what information she did have and really made Eleanor come alive for the reader. Her writing isn't as "fun" as that of Alison Weir but it was still enjoyable. A balanced history of Eleanor; I would liked more quotations from sources. It flows well and moves along, but I wouldn't say it was an unbiased biography. This book was good. Very, very informative for the little we seem to know about Eleanor. It was quite funny as well. It was a requirement to read this for my Western Civilization class (had a quiz on the book as well). I just did not find this book to appealing, though that might be because it was a "forced" read instead of my personal choice to read. This was a beautifully written book. Unfortunately it veered away from Eleanor from time to time to focus on the misdeeds of her husbands and her children, but that can really be blamed on what little was recorded of her and her actions at the time rather than on any part of the author. Gripping read and definite recommendation. Eight centuries on, records still remain to prove that Eleanor of Aquitaine was a remarkable woman: beautiful, robust, energetic, courageous, resilient, intelligent, cultured and a shrewd negotiator when given the chance. In a world where the status and security of feudal lords depended on the possession of lands, her inheritance of the extensive and prosperous French Duchy of Aquitaine made her an attractive marriage partner for two rival kings: firstly, the indecisive and monkish Capetin Louis VII of France, whom she grew to despise, and later by complete contrast the Angevin Henry II, Plantagenet ruler of England, a vigorous, driven man with an uncontrollable temper and insatiable sexual appetite.Eleanor accompanied Louis on an ill-fated Crusade, slowing the procession down with her vast quantities of baggage. She often risked dangerous voyages, even when heavily pregnant, and almost up to her death, aged eighty-two, embarked on tours round her lands to maintain the loyalty of vassals and foil rebellions.In the unlikely event of her being as promiscuous as painted by detractors, this would have fallen far short of Henry’s predatory treatment of women. Scandalous gossip, embellished long after her death, buzzed round her close friendship with handsome men like Uncle Raymond of Antioch, her probably mythical, failed attempt to elope with Saladin, and demand for divorce from Louis and immediate marriage to Henry, fourteen years her junior. Yet ultimately she was always to be constrained by the superior power of men: the Pope blocked her divorce until Louis decided to end the marriage because of her apparent inability to bear sons. Ironically, she produced four boys in rapid succession for Henry, the ill-fated John born some years later being the last of her ten children. When, in the 1170s, Henry’s heavy-handed mismanagement of his sons provoked their revolt, Eleanor’s support for them was punished with sixteen years of imprisonment, but this did not break her spirit. When it suited Henry to let her administer affairs in his frequent absences from England, she performed with great competence. Similarly, in her self-imposed exile to Aquitaine, unable to tolerate close at hand the humiliation of Henry’s overt affair with the legendary Rosamund Clifford, she again stabilised with her shrewd and fair management a region which Henry had only disturbed. Yet again, when her favourite son Richard Coeur-de-Lion succeeded Henry, she ran Aquitaine in his absence and drummed up a heavy ransom for his release when he was kidnapped by, of all people, the Duke of Austria.Marian Meade’s journalistic style, which sometimes slips into quaint phrases involving “hie” and “goodly”, and often seems padded out with purple prose, succeeds in breathing life into what could be a tedious, indigestible wade through long-forgotten events. I have to believe her assertion that “none of the dialogue is invented”, but the continual references to, say, Eleanor’s thoughts, together with a lack of clear sourcing of anecdotes (at least in the edition I read) make this seem like “faction” rather than academic biography. Whatever the truth, this very readable account brings home the insecurity of Medieval life. Apart from the risk of sudden death, feudal property-owners were forced into a continual soap opera of shifting allegiances, trying to take advantage of each other, or avenge some past wrong. It is fascinating to appreciate the lack of a sense of “nation state”, the ease with which castles, lands and marriageable offspring were traded: even the Lionheart did not speak English! The ephemeral fragility of the Angevin Empire which Eleanor worked so hard to build with Henry gives sobering food for thought. There is no accounting for one's passion. And mine happens to be Eleanor of Aquitaine and her times. This biography outlines the significant events of this medieval feminist, but, as with all histories, one cannot help but wonder how much is speculation, and what is factual according to the known records and documents of that time. This book is very easy reading despite the number of characters, places, palaces, and intrigues. Eleanor's life is one that I could aspire to, but doubt I would have had the strength of character or physicality to have accomplished what she did during her long and productive life.I will be traveling to France in a month to the area of Angers and hope to visit l'Abbaye Fontvaulte. It is my hope that I am able to ask numerous questions that most others in the tour will be either surprised by or disinterested with as a result of this reading.In a previous trip to France, I had visited the Chateau Galliard in Les Andelys on the Seine River, and had picked up an unusual stone that I still possess, 20 years later. I had forgotten that it had been built by Richard Coeur de Lion, Eleanor's favorite son. To read about it in this book, remembering how meaningful that visit was to me then, even though I didn't understand why, and to have its' history return to me through this book, is a synchronicity that I cherish even if I don't fully understand what it means.I hope to next explore the sound of le langue d'Oc, and the poetry and the music of that time. Please join me in celebrating the joie de vivre of historical France, and enter into this privileged society by reading this book.Update: I have returned from my trip to France. Although I was unable to visit l'Abbaye Fontvaulte, I did explore the Castle in Angers where Eleanor of Aquitaine and her first husband, St Louis, would have lived during their stays in the Loire Valley. St Louis' history is thoroughly explored in the historical castle models on display. What is shocking is the fact that his first wife, Eleanor, is completely (!) left out of that history lesson. Apparently France has never forgiven her for divorcing Louis and marrying the future English king, Henry II. One turret of the castle is named after Louis' mother, Blanche of Castile. Within the castle is an absolutely magnificent tapestry of The Apocalypse that took seven years to complete during the Middle Ages; it is the largest in the world, well worth the visit. I hope to return to see it again one day. Magnificent! What an amazing person Eleanor was and not much has changed since she lived here on earth. The land of Aquitaine was very progressive and of course the rest of Europe saw this as a threat to their religious beliefs. Aquaitane treated women as equals and they were educated, owned land and were participating in life. Eleanor knew when her father died that she was vulnerable to the world's politics in that Kings could come in and physically take her and her land. So she did what women have done since the beggining of time she took control and arranged her own wedding to the King of France. This move married her to a King that would value her land regardless of whether or not he valued her as a person. Unfortunately for Eleanor the King of France had issues with his sexuality and projected them onto the Queen. He considered her attractiveness as evil. Hiding his vulnerability to her and projecting his desires to her manipulative manners. She was considered less than because she did not give the King a Son in a time when women were held accountable for the man's lack of female genetic material in their sperm. Well some things have changed. In due time she took action to make her life different by getting an annullment thorugh the church and marrying a younger King of England. At first, one could say Go Eleanor. However, the young renegade of England had a serious problem with intimacy and could not remain faithful. Eleanor endured being traded out for a younger and younger model (younger women who are gullible and desperate for love and attention will jump on pretty much anything regardless of age). So sad...alas...according to the writings and there were not many focused on this interesting woman she lived without true love, passion and and an object of her desire. I would like to think not. That this state of affairs was more an oversight due to the sexism of the time. It wouldn't be good to talk about the affairs she may have had and which were more likely. Rationally she was an attractive Queen of not one but two countries. She obviously was very intelligent and more than likely had more than a few male admirers! Quite an amazing woman to have borne 10 children and lived into her 80+. Too sad that so little is written or known about her. I learned about her in school as a child, however, it wasn't until I found her in my ancestry tree on Ancestry.com that I became intensely interested in her life. The writing was excellent. Very readable, but mainly because it is written as though Meade was there and privy to the personal thoughts and feelings of those about whom she has written. Not a paragraph is without supposition and conjecture, what xyz person would have felt, understood, why they decided on a certain course of action. While this makes it a more engaging read, and perhaps more interesting, it is maddening from researcher's perspective. Though Meade does list sources for quote, her speculative writings are left unreferenced. Furthermore, I have a personal dislike for the style of referencing used. Rather than use standard footnotes or endnotes with numbers, the references are in the back of the book, ordered by page number and the beginning words of each quote. This is hardly the most efficient style available, and can be frustrating to stumble through. The author did, however, use a decent number of sources, though most are from modern times, making the references themselves secondary sources, at best. As such, while the bones may be factual, the meat of the book is most likely more historical fiction than fact.Over all, "Eleanor of Aquitaine" is a fun read, but one must bear in mind the author's opinions and speculations are solely her own, and not necessarily based in fact. As such, this book is best as a first foray into Eleanor's life, but not recommended for use as reference material. This was a fairly fast read for a medieval biography. A queen of both France and England, she carved out her own history in a time when women had little personal power. I was happy to see both a genealogy chart and a map of Medieval France and England in this book. That made it a lot easier to keep track of who was who and how they were related and to keep track of what happened where. However, maps of the Crusades that occurred in Eleanor's lifetime would have added a lot to my own understanding. Also a genealogy chart of Louis VII's family from his later wives would have also been of great benefit, as these children greatly figured into the life and times of Eleanor of Aquitaine.While one of the greatest queens of England, there is little in the annals of both French and English history of her personally. Married to King Louis VII of France, divorced, then married to Henry II of England, she has been both reviled and admired for the last 800 years.Mother of both King Richard the Lion Hearted and the weak willed King John of England, Eleanor of Aquitaine, lived 82 years and did her best to keep the Plantagenets of England on their thrones of England and in France. I am undecided about this book. It was hard going for a start - and I know a reasonable amount about Eleanor and the period of time covered by the book. The writing style just wasn't massively accessible sadly. The main issue I had was that it was filled with conjecture "Eleanor MUST have felt like this", "Eleanor WILL have felt that". That bothers me because we do not know what she felt only what she did. I don;t particularly like this kind of assumption in biographies because we do not know feelings only facts. Sometimes maybe we can assume feelings but only if evidence suggests it. there is so little contemporary evidence of Eleanors' feelings that it just doesn't sit well with me.I would not recommend this book for someone new to this period of history simply because it is so hardgoing. There are other biographies of Eleanor that provide a more accessible way into the subject. I cannot fault the writer for research and effort however. Eleanor is an elusive subject in many respects but the style of writing lets this biography down somewhat. I didn't select this biography specifically, just sent my husband out to buy "a biography of Eleanor of Aquitaine", to try to undo some of the damage done by a bad piece of historical fiction. There are many out there, and I may be tempted to pick up another just to see another angle, or different details, or something. This version was reasonably well-written and seemed to rely on primary sources, was very educational, and was an engaging read from beginning to end. However, there were some ham-handed attempts at fleshing the narrative out that I wasn't sure about: why all the commentary about her robust sexual appetites as a youth, with no recorded or substantiated romantic affairs? Simply because she was a beauty from the South? And some odd descriptions about weather, thoughts people were having, etc. So, I may pick up another version just to see if I might like it better, but all in all, this one was pretty good. I feel like the record was set straight, and I enjoyed the read. I confess to being a little obsessed by Eleanor of Aquitaine - infact all medieval history. She was a fascinating individual who managed to live to the remarkable old age of 82 in the 12th century when most women died very young indeed - even Queens. She was Queen of 2 different countries, she travelled for 2 years from France overland to the Holy Land on a crusade with her husband the King of France, she gave birth to 10 children and her next husband (the King of England)incarcerated her for 15 years for organising a failed coup with her sons against him. She still refused to release her lands and wealth to him in return for liberation and it was only upon his death that her son Richard the Lionheart was able to grant her freedom. What a woman - all in the age of no dentistry, anaesthetic and antibiotics! In a time when a woman's only job was to birth children comes Eleanor of Aquitaine, future Queen of France and England. Id heard of her in passing, as the mother of King Richard the Lionheart, but knew nothing about her. In this biography I have found a female medieval heroine, a woman who refused to accept her limitations as a woman in a patriarchal society. A woman who helped rule and govern two of Europe's major kingdoms, who refused to be left in fruitless marriages and who battled on to live into her seventies. A true battle axe of a woman and an inspiration to women; even in the 21st century. The biography is well researched, easily read and brings to life 12th century Europe for the noble class. Recommend to anyone interested in medieval history, women's history or want a better understanding of those turbulent times. Reality TV has nothing on Royal England. I'm convinced that any King named Henry is destined for an amazingly scandalous tenure on the throne.When I started reading it I felt the material was a little dry and academic. As it got into the meat of the drama I forgot that I could not hear Eleanor's voice at all (she left no letters, poetry, etc. so the author does not try to recreate her tone as she has no proof of what it was). By the end I appreciated the succinct and very meticulously researched and detailed account of her life. Without overtures or guesses into how Eleanor really talked, spoke, or interacted I have in my mind a clear picture of her - the author succeeded in making this a well documented and accurate account of her life.